Commercial | Residential Carpet & Tile Cleaning Lancaster, PA.
We guarantee every job, if you're not happy with the cleaning - it's free. We also offer a 30 day spot and spill warranty. We are in the business of making our clients happy. It's amazing how good the carpets clean up these days with all the new technologies; machines, tools and detergents are so much better than when we started this business over 25 years ago. I know our pets may look innocent, but if you smell urine they might be doing more than you think. We have a very powerful UV light so we can see every urine spot and treat it with our enzyme urine treatment. Does your house smell like pet urine? Give us a call and let us use our new urine treatment system on the carpets. We’ve been having great results with it, it’s a special enzyme treatment and extraction that will continue working on the odors long after we leave. It will eliminate odors caused by urine, feces, vomit, smoke, skunk and more. So before you replace your carpet because of pet odor give us a call 717-397-3883. Cleaning up Lancaster County since 1992. Hello and welcome to our web site. We are Darwin and Lori Roes and we're glad you found us! Statewide Carpet Cleaning, Inc. is a family owned and operated business in Lancaster County, PA.
Do you run a clean business? Many business owners have no idea how bad it looks to have dirty carpet. It's very bad for business. People like to do business in a nice clean environment and if you don't have it, they will go somewhere else. Remember, first impressions count! We are all aware that the quality of the service industry has fallen these days. It amazes me how some companies can stay in business. We see companies in the carpet and tile cleaning business come and go all the time. We have been here in Lancaster PA cleaning carpets since 1992. Veterans always get 10% off, just our way of saying thank you for serving our country. Darwin and Lori Roes from Statewide Carpet have done an outstanding job for us for the last ten years. No stain ever got past them. Not only is their work top notch, but they have been willing to go above and beyond the call of duty on several occasions. Just before we moved, we had a carpet stain that kept coming back. Well, Darwin and Lori also came back until that stain was gone. They were working even as prospective buyers were doing a 2nd walk through of the house. Those prospective buyers became the actual buyers of the house and I have to think that some of that sale was thanks to Darwin and Lori. That is just one example of a time when they made sure that the job was the best that it could be. They are the best and I highly recommend them and their work without reservation. 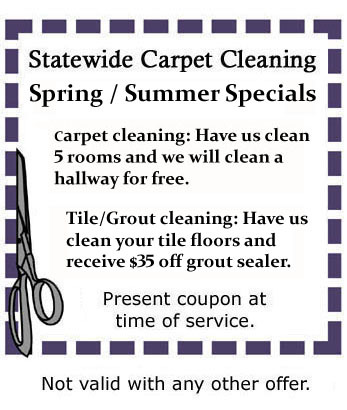 Since 2010 we have used Statewide Carpet Cleaning 6 times including the most recent on 3/11/19. Their work has been fantastic, I whole heartedly recommend their services. That is why we offer a 100% money back guarantee - if you’re not happy with the cleaning, it’s FREE (that saying is on our van). How many companies dare to advertise that and stand behind it? When you hire us to clean your carpet or tile & grout floors, it truly is a family business. We have no employees and we like it that way. Many companies pay their people by a percentage of each job. So naturally they want to do as many jobs in a day as possible. Lori and I as owners, want to do the best job possible, so you will use our services for many years to come, like the rest of our clients. March / April Carpet cleaning - 3 rooms or more and we will clean a hallway for FREE. Tile/Grout cleaning - Have us clean your tile and we will take $20 off the price of sealing the grout. Click here for the coupon.